Juggler Clown Tom Bolton’s website. Tom’s primary market is in German speaking countries, so the main navigation shows German language pages. The ENGLISH versions are in the drop-down menus! Clown Tom Bolton offers quality entertainment with shows or walk-around entertainment. For both private and company clients, clubs, organizations and municipalities. Company events include conventions, trade fairs, openings and open-houses. Anniversaries, parties, promotion events and markets. Festivals, product presentation and lots more. For private customers, juggler clown Tom is happy to be the highlight of your wedding, birthday party or confirmation. New Year’s Eve party, Christmas parties or any special occasion will do. 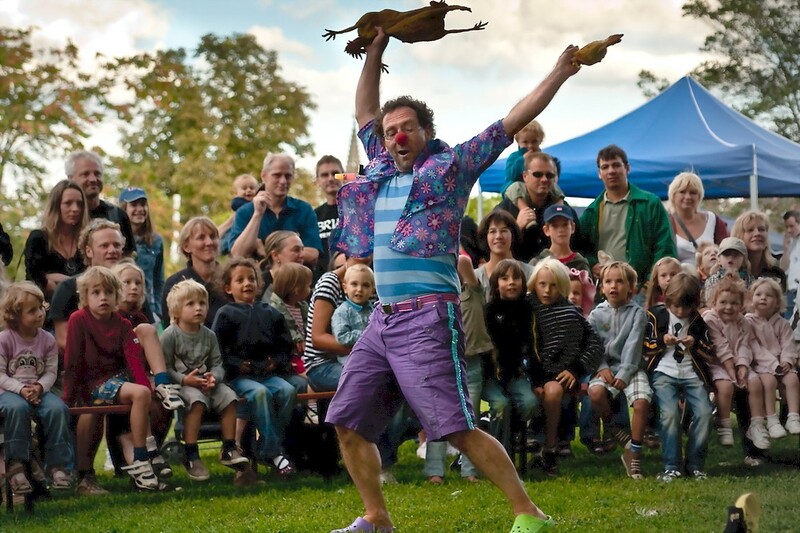 For clubs, organizations und municipalities, Tom is always a hit for festivals and all sorts of open-air events. 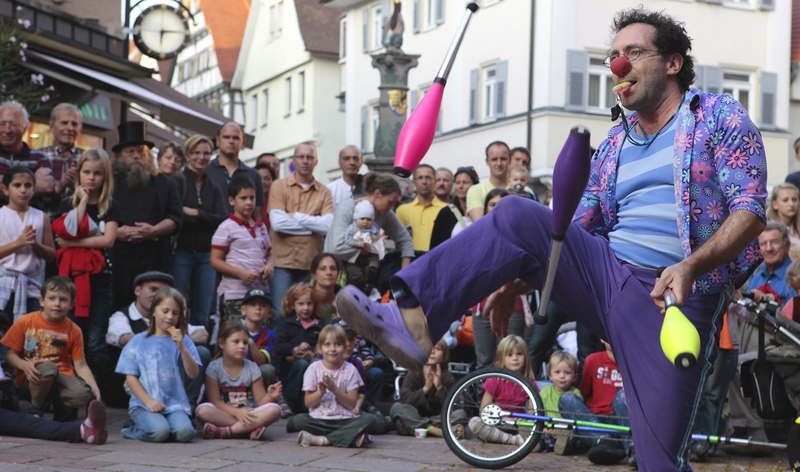 Originally from the USA, juggler clown Tom now lives in Stuttgart, Germany. He works not just locally but throughout Europe and is available world-wide for festivals and bigger events. With a University degree in business and finance, Clown and juggler Tom is sensitive to company priorities. He can highlight selling points of a product or to make a good atmosphere while staying in the background when needed. So can sales personnel optimize their presentations. Whether it is an event for business people or for children, Tom has over 30 years of experience. He’s an artist that knows how to fit his entertainment appropriately to every situation. 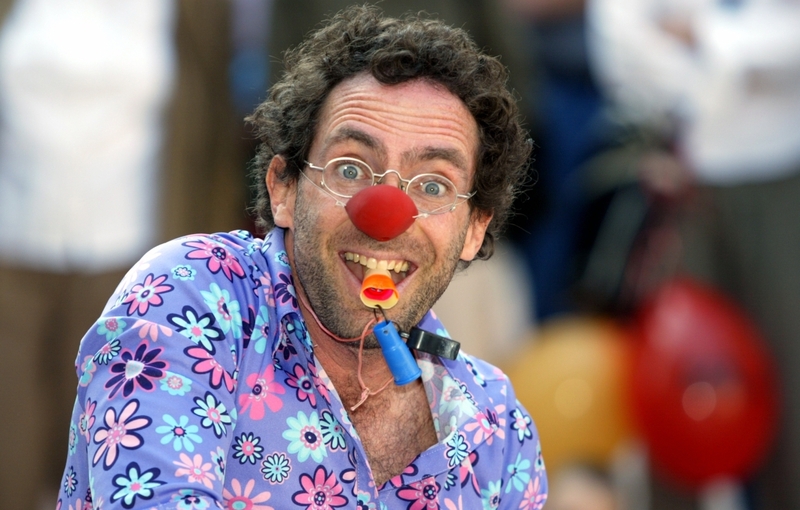 Clown Tom Bolton is an accomplished juggler with clubs, balls and cigar boxes. Juggling torches or rubber chickens on top of a tall unicycle is always a highlight. 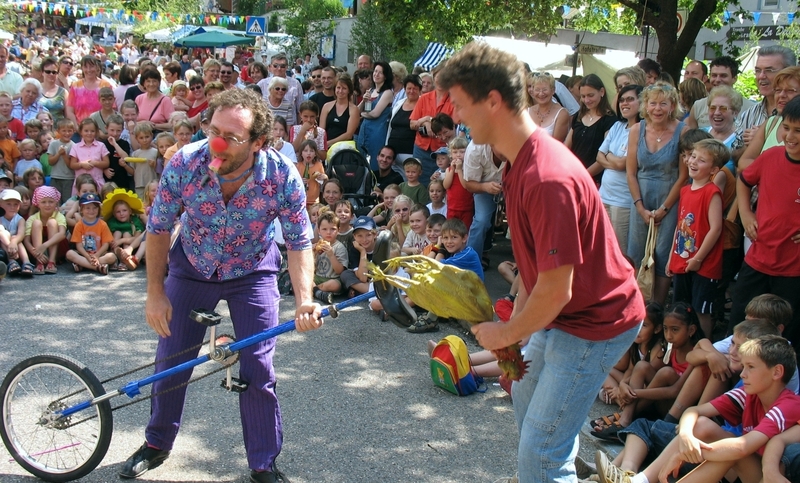 In addition, he combines slapstick, magic and balloon-modelling with fast-paced improvisation. He uses situations and members of the public in a provocative but always respectful and appropriate way. Tom has self-humor and his goal is to make his audience the star of every show. He doesn’t make them a victim or punchline of any joke. His shows are usually done without speaking – accompanied with background music where desired. They are enjoyable by all people without barriers of language, age or culture. 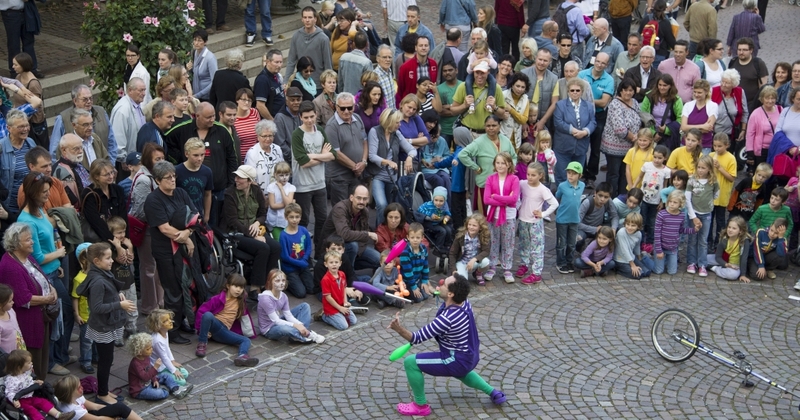 Juggler and clown Tom Bolton’s walk-around entertainment is more personal. It entails making jokes and gags with individuals or small groups. This is perfect for greeting guests or strolling between the tables while they eat. Tom finds something funny about any situation. Tom is also accomplished at making balloon figures or teaching juggling workshops. More details as to where walk-around or strolling entertainment vs. shows is suitable can be found on the „Entertainment“ page. Tom likes to use subtle costumes. Although he uses a traditional red clown nose, he does not paint his face. Sometimes people think that one is not a „real“ clown if he doesn’t have overly colorful cloths, big shoes and a painted face. Actually many modern clown not only have dark cloths and don’t paint their face but don’t even have a red nose. This is all a matter of style. There are a number of good reasons for Tom’s style. For one, many people, especially small children, are afraid of the stereotyped painted face. Tom thinks it is more important to do funny things than just to be painted to look strange. Also, Tom juggles and rides a unicycle in his show. This is nearly impossible with classical big clown shoes. It also means that he sweats from so much jumping around. He doesn’t want heavy costumes or this could cause any face paint to run, which looks bad and gets in the eyes. So if one expects a classical clown with a wildly painted face, then Tom might not be their first choice. It’s like deciding for a band. If one wants rock music, then hire a rock band. But don’t say that a rock band is no good because they don’t play Mozart and Beethoven. Or vice versa. What does a performance cost? The first question asked by many is; “what will it cost?” The answer depends on many factors. What needs to be done, for how long, where, how many days, time of year, day of the week etc. Call a car dealer and ask what a car cost. They will also want to know the make and year, since a 15 year old VW Golf is going to be more than a new Porsche. So take the time to describe what you want and you will get a fitting offer. In general, I ask between 500 and 1200 Euros for a day plus travel, accommodation when needed plus 7% Value added tax where valid. Multiple day gigs will usually be cheaper per day than a single day gig. A short local gig for a small group on a Wednesday morning might cost less. If I need 3 extra days of travel to get to and from an event in Timbuktu then it might cost more. Performers routinely hear, “oh, but it’s for kids” or “but 500 Euro is too much for just an hour”. Well, Tom provides a professional service with over 30 years experience. He doesn’t think the budget for children’s entertainment should always be the last consideration. Also, an hour of performing is only part of the work. A performer must train, make costumes, buy and repair equipment as well as run an office. This includes sending out offers, contracts and bills and maintaining multiple websites as part of a marketing strategy. Preparing and driving to a gig with a time buffer in case of traffic often means multiple hours get invested for that “just 1 hour” of entertainment. Also self-employed performers gets no paid holidays, no free weekends or sick days. Also no unemployment benefits, even if they go a long period without work. All expenses and insurances they pay themselves. It’s a business – and not just an hourly wage. If not missing out on better paying gigs, a discount might be made for extra small events or for a good cause. But this is at Tom’s discretion. Many people organize an event and seem to expect to get free entertainment. Sometimes they justify this by saying a donation will be made to a charity. Yet the organizers are being well paid. So are the suppliers of the location or stage, sound and light equipment – and the rental toilets are all charging full price. Juggler and clown Tom Bolton supports a number of circus school projects for poor kids in the third world. This despite earning very little – but he cannot afford to work for free. Another point that some people seem not to understand is that while Tom is great with kids, his job is be a clown and performer. It’s NOT to be a baby-sitter. He can entertain a room full of kids but needs some support. There should be at least one adult for every 5 to10 kids or so to maintain some control. Otherwise some kids might bother each other or destroy the show. A short word or glance from someone with a little authority is usually enough to keep kids on their behavior. Clown juggler Tom’s energy is best used to present a show or to make balloons or teach juggling. Running after kids, telling them what to do is not his duty. If the adults want to be free from any care of the children then they should arrange additional personnel. Don’t just expect the clown or magician to do it. Like a performer in a club, if he is busy on stage, he cannot play doorman and bartender all at the same time. Clown Tom Bolton does NOT offer face-painting. Nor painting or arts and crafts to keep the kids occupied. Such activities fit well to big events and complement what Tom does but he cannot do everything at once. Such activities don’t require a highly experienced performer. So it is more cost effective to hire other people who specialize in face painting and have Tom concentrate on what he does best; making great shows. If desired, Tom can recommend face-painters or additional performers in the Stuttgart, Germany and other selected areas. In addition to English, clown Tom can converse well in German and usually struggle through with Spanish and French. He has traveled for work or pleasure to over 50 countries on 5 continents. He feels at home in nearly any setting. With a silent show and good use of body language, his humor is acceptable for any class, culture or religion. It universally brings a smile to anyone’s face. Tom’s intention is to help bridge cultures and celebrate the things we all have in common. This is not always easy in the modern world. But it is the ambition of a clown to show that laughter can help heal many wounds or misunderstandings. Tom does not perform for extremist groups that promote hate or violence of others.